Let your last layer be your favorite because, after all, your coat is the piece that gets the most playing time in the winter. On busy days when I'm out and about, my coat is my outfit. This season I chose a wool coat with leather sleeves - timeless with an edgy flair. Underneath my star piece, I kept it polished and simple. Opt for a neutral color scheme that compliments your outer layer while adding interest with a special necklace. I can almost never say no to pearls - especially when worn with an elegant black ensemble. How very Audrey! It's no secret that leather has been my weakness this entire season. I've featured this luxe and of-the-moment texture in almost every post recently. So when I spotted this wool coat with leather sleeves you can imagine my excitement. I think it's the perfect marriage between classic and contemporary and I feel so chic wearing it every day! Go ahead and pop your collar for a little extra protection from those flurries; not to mention a high-fashion vibe. Center an entire outfit around your coat for a warm look that you can comfortably - and stylishly - wear both inside and out. A combo of leather and calf hair puts these booties ahead of the shoe curve. Pearls never have and never will be out of style. But to give your look a modern update, don't put your pearls on double duty. If I'm wearing pearls around my neck, I choose something other than matching studs in my ear. I have only recently started taking coat selection seriously. Up until this year (I know, I've been so behind), I wore my white North Face fleece everywhere. I thought it was the only "coat" I needed. How silly of me! Don't get me wrong, North Face jackets are great, but they aren't exactly a star on the fashion world stage. After investing in three fabulous coats this past year that are beautiful, warm, and versatile, I feel much more prepared for looking chic in any type of weather. Be proud of your last layer and make it your most stylish layer yet! When wearing all one color - black especially - it's vital to incorporate a variety of textures into your ensemble. This allows the eye to see each individual piece clearly, thus eliminating the "blob" illusion. In short: you'll look leaner and chicer, and your clothing will appear more expensive. Here I've got leather, silk, cotton, and ponte all in one look. Match your footwear to the rest of your one-color outfit to create the illusion of length. For us short girls, this trick is everything! Don't be afraid to add a splash of a different shade for variety's sake. 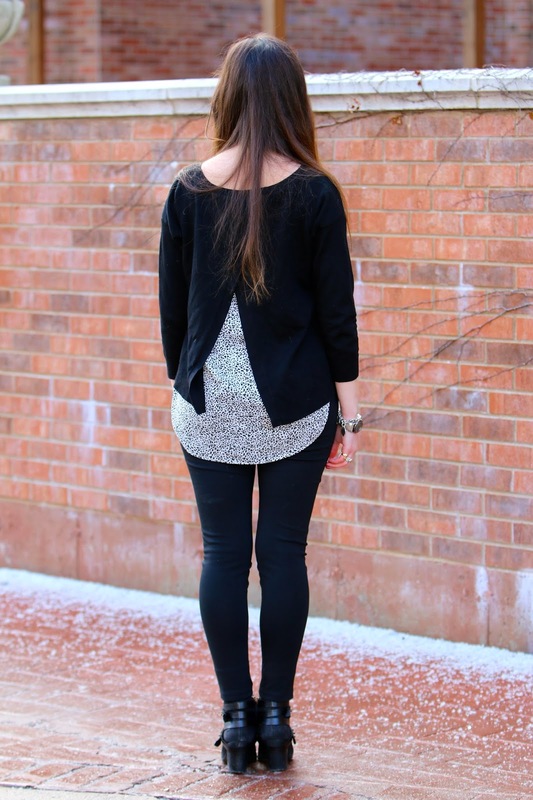 I love the way this sweater opens in the back and includes a built-in layer. Use your layers wisely and you'll pull off a dramatic effect. It's all about thoughtful proportions baby! Up your jewelry game by adding a leather band into the mix. The result? A boost of instant edge. Silver spikes only intensify your cool factor. This metallic Marc Jacobs watch makes yet another appearance on my blog. It's now my most worn timepiece and who can blame me? Its modern design and sleek face look fabulous with absolutely anything! Dark pearls for a subtly seductive take on a classic. Black represents power, sophistication, and timelessness. It's always on-point and always versatile. Lately - maybe this comes with age - I've been gravitating towards it more and more. Black has got my back during hectic mornings and episodes of weight gain (can anyone say, after-holiday-pounds)? When it comes to dressing, black wins. Always. My dad and I took these photos two days ago before we got a load of snow yesterday. Just when the bitter cold seems to be melting away, we get another dose of chill. My dad refers to it as "snow way out"...haha, get it? But no one will get hit harder this week than the East Coast - to my friends in New York especially, stay bundled! Forget winter's dark hues and monochromatic pieces - inject some flower power into your wardrobe for a fresh take on cold-weather fashion. Trust me, it's never too early to bust out your favorite florals! 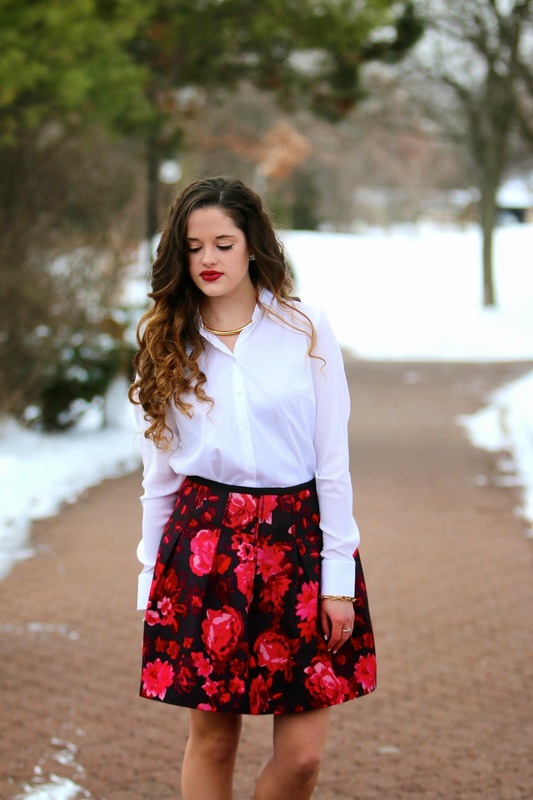 This look-at-me skirt gives "winter flowers" a whole new meaning. I almost fell out of my chair when I saw it on gap.com this fall, but I resisted purchasing because I'm trying to be good and save. However, after months of holding off, I finally visited the website again a few weeks ago and saw that it was 50% off. But this skirt has been so popular that there was only one size left - and it just so happened to be my perfect fit. Some things are just meant to be! Invest in a classic white button-down. They go with everything and can be worn for any occasion. From work to weekend, I know that this blouse has got me covered. 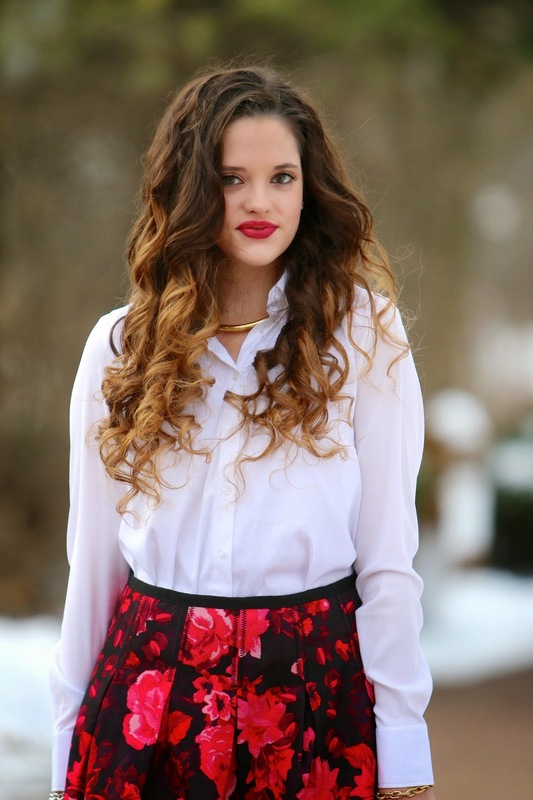 And of course I love it best when paired with a red lip and my favorite Kate Spade earrings! Chokers are back! Inspired by everything from 90s minimalism to tribal jewelry, this need-to-know classic will take any outfit from simple to standout in an instant. The design works perfectly under blouses or over sweaters. Update anything in your closet with Ann Taylor's calf hair and leather booties. Black shoes are a fashion staple for me but I recently realized there was a gap in my collection. I own black pumps, black sandals, black strappy heels, black OTK boots, black wedges, and casual black booties, but until now I didn't possess any fancy black booties. So you may be thinking, "Really Kathleen? Do you really need another pair of black shoes?" - that's what my mom said. But honestly, my collection was not complete without these babies. A black bootie that you can wear to formal events is a must-have! A touch of gold to brighten the mood even further. My white blouse gets a contemporary update with a choker, of-the-moment heels, and a dramatic skirt. I just adore everything about this classically fierce look - I think it captures the essence of modern femininity to a "T," what do you think?